Example: A 1 inch wide collar will be less comfortable for a dog in comparison with a 3 inch wide collar because all the pressure will be applied over a smaller surface area. Recommendation: If you are not sure which width to buy, please choose a standard 1 1/2 inch wide collar, which is the most popular average collar width for the majority of large and medium dog breeds. Easily Adjustable Nylon Dog Collar: If you have an adult dog, then you won’t have any troubles with it. Healthy fully grown dogs usually stay the same weight and size for most of their life, therefore when you purchase a collar for a fully grown dog the adjustments will be minimal and you will probably use only one hole to adjust the collar on his or her neck. The exceptions are the dogs with long or dense hair the length of which can change from time to time because of season grooming and hair cuts. For such dogs you should: For minimum adjustment - measure the neck circumference right after a haircut. For maximum adjustment - measure the neck circumference when your dog has the longest hair. Another exception is overweight or underweight dogs. In these cases, if you are going to put your dog on a diet, you should take into account how it can affect your dog’s dimensions. Please take it into account when buying a collar to avoid a situation of wasting money on a collar that no longer fits your pet. The tricky situation is acquiring a collar for a puppy. The best thing to do is to choose a low budget collar until your puppy is at least 10-12 month old. The standard adjustment range is 4 inches (the distance between the smallest and largest adjustment hole of the collar). Four inches collar length will be great both for dogs with or without long hair. If you feel that you need a larger adjustment range, please contact us and we will be happy to help you in most cases. Sometimes an additional fee will be charged. Please note, that if you are going to use the collar on its smallest adjustment hole there will be an approximate 5-6 inches of extra collar length which you might want to cut off. We work hard to keep our dog collar prices the lowest in the world. We have a wide price range of collars. Some collars are more expensive, they are made of genuine leather and have the unique design. Remember, you get what you are paying for. We have fine nylon collars which are under $19. 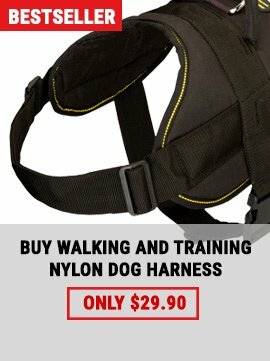 Being rather cheap, they are still of great quality and provide your dog with super comfort. There are also many wonderful and unique design collars within $20-$35 price range. Nylon. Choose a nylon dog collar, if you want an easy-to-use all weather dog supply. It is suitable for walking under the rain, snow, swimming and for high humidity climate. These collars are rather strong, lightweight and low priced. Leather. 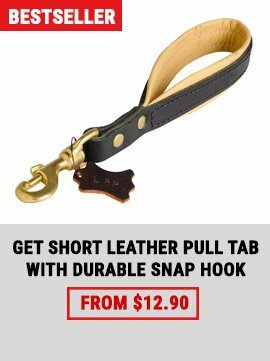 Choose genuine leather, if you want a safe natural dog collar which looks even better with years. A leather collar can serve you for a life time. Just make sure to treat it occasionally with water repellent and leather conditioner. Leather does not like water but when you apply a water repellent, you will protect it from moisture. So, if you get accidentally caught up in the rain, you may not worry too much about its quality. 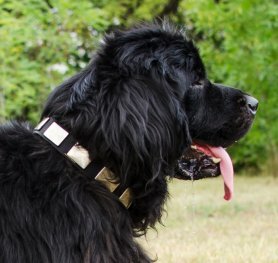 Leather collars are also perfect for dogs with sensitive skin who tend to have different kinds of allergies when contacting with artificial material. Metal. Choose a metal collar when you are looking for a special one which will help you to correct your dog’s behavior. There are stainless steel, brass and curogan dog collars. Stainless steel collars are highly rustproof, they can be also covered with chrome layer for better resistance to wet. Curogan collars are great if you want to avoid allergies and discoloration of a dog’s coat.